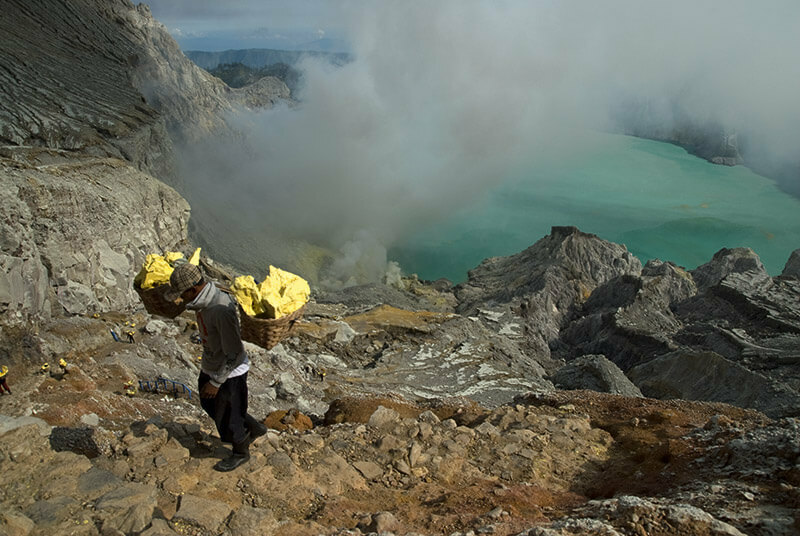 The Kawah Ijen volcano in East Java, Indonesia, has one of the largest sulphur mines in the world and the only mine that is still quarried manually. 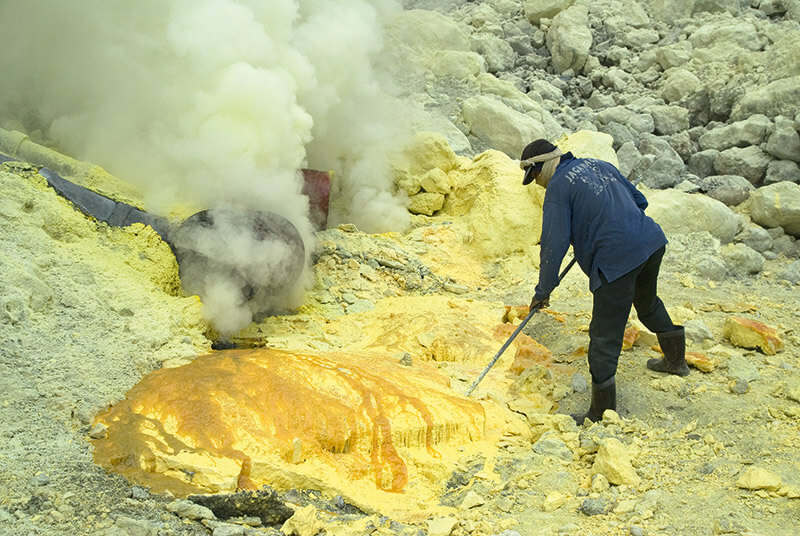 Hundreds of men from the surrounding areas undertake the task of retrieving blocks of sulphur from the crater of the volcano. 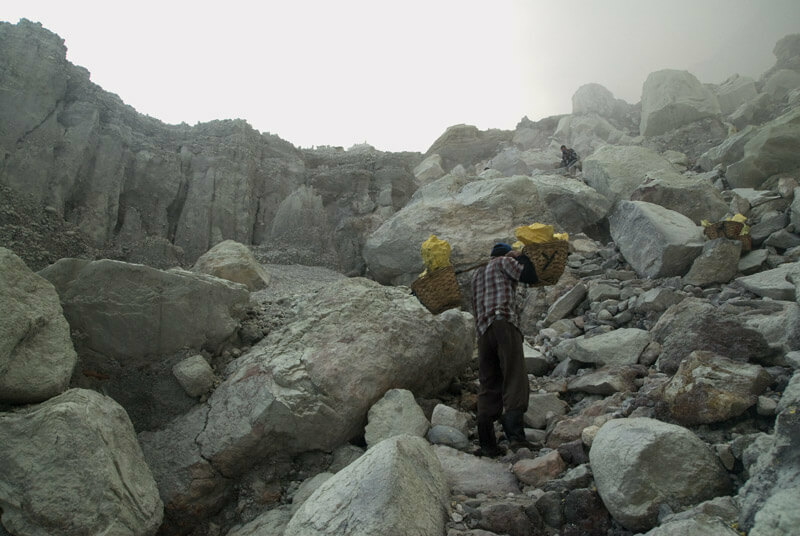 They trek down the perpendicular path from the rim of the volcano to the crater below and retrace their steps with a load of 80-90 kg of sulphur. For this arduous task undertaken twice a day by each miner, the pay is $10-12 per day. 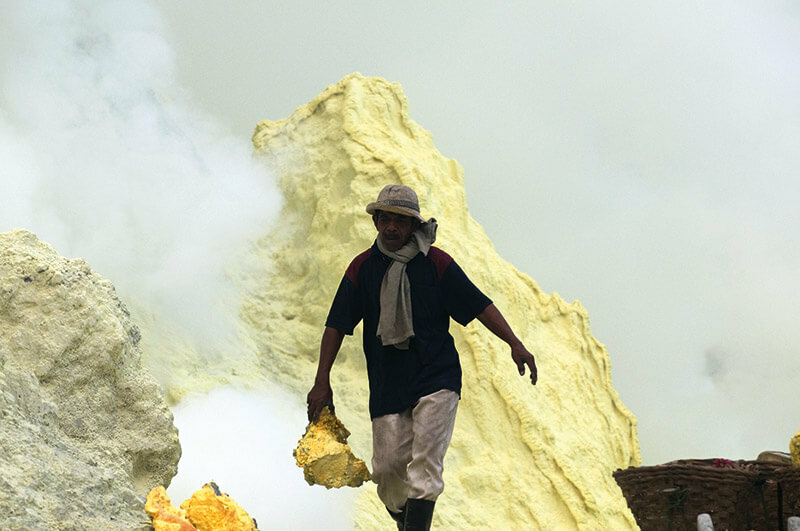 For each kilo of sulphur, a miner earns 800 Indonesian rupiyah ($0.06). 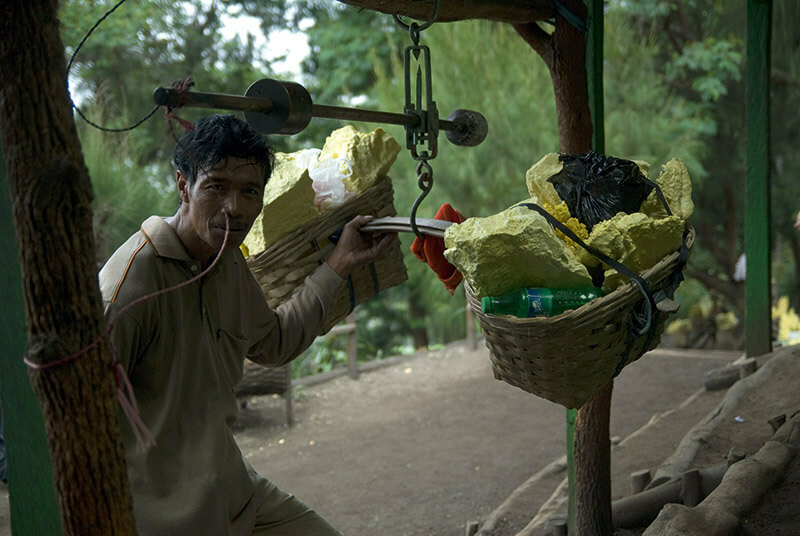 In two trips, if he can carry 150 kg of sulphur he can make $9.5. A farmer in the surrounding rice fields earns about $4 a day. This relative benefit comes at a terrible price. 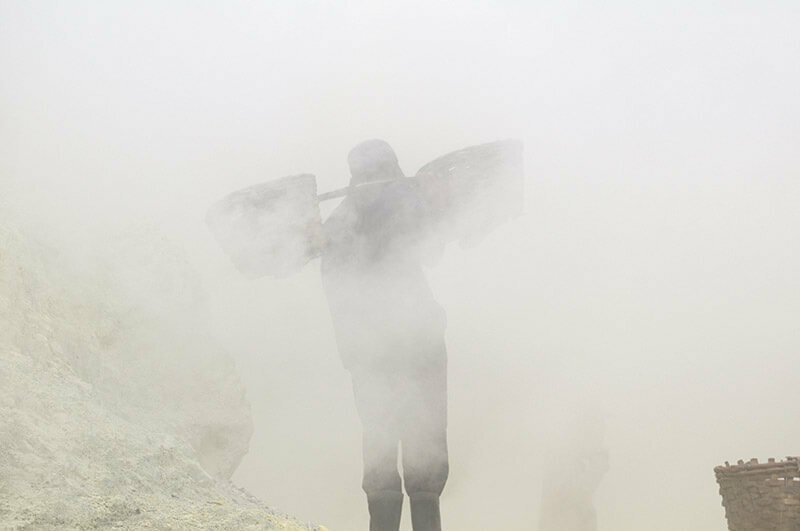 The volcano site contains an acidic crater lake that emits a smoky aura of bizarre beauty. 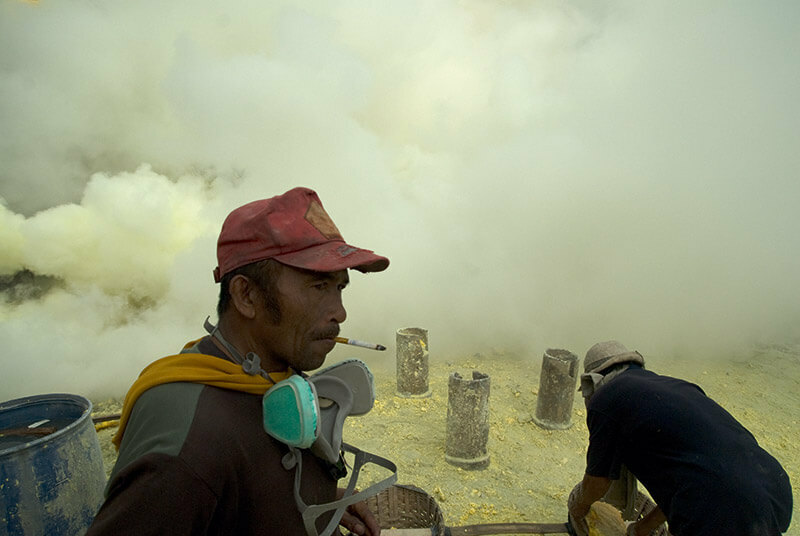 While it looks like steam, the fumes are actually highly concentrated hydrogen sulphide and sulphur dioxide gases that can burn a miner’s eyes; repeated exposure to moderate concentrations of sulphur dioxide and hydrogen sulphide may cause inflammation of the respiratory tract, wheezing and lung damage. The chemicals are also harmful to the reproductive system. The miners work amid a toxic environment with gas concentration levels that are 40 times the limits. They have little to no protective gear beyond a damp cloth to cover their nose and mouths. Many of them do not care to use proper gas masks because the masks slow them down resulting in less earnings. However, they are well aware of the fact that such prolonged exposure in the toxic environment leaves them in the high risk zone of poisoned lungs, decreasing their life span. Most of the miners die before they reach 40. Since mining started in the volcano in 1968, gas explosions caused the death of 49 workers in 1976 and another 25 in 1989. Sugato Mukherjee is a photographer and writer based in Calcutta. His works have appeared in The Globe and Mail, Al Jazeera, Yale Journal of International Affairs, Roads & Kingdoms, Lonely Planet and Jet Wings International. His coffee table book on Ladakh has recently been published from Delhi. A recipient of a number of photographic awards, Sugato is currently working on his long-term project on Kashmir. His photographic images and stories are represented by Indian Art Collectors, New Delhi and Diimex Picture Desk, Sydney. 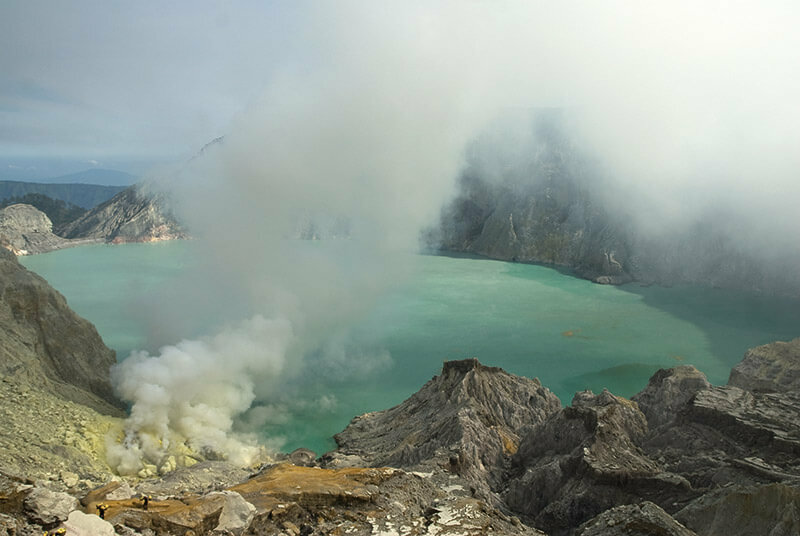 Kawah Ijen has the largest acidic lake on Earth – a long volcanic crater lake that is a rich source of elemental sulphur where about 400 men collect yellow lumps of sulphur daily. 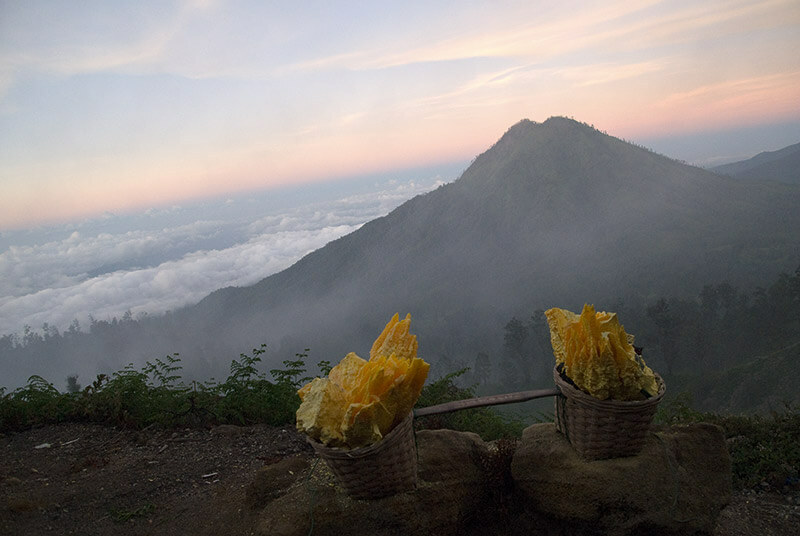 Dawn breaks over Kawah Ijen, one of the active volcanoes of East Java. A sulphur basket waits on the roadside to be taken down. A group of miners working in the crater with little or no protective gear. The hike from the road to the crater and back is about 10 kilometers and the gradient is steep and at times almost vertical. 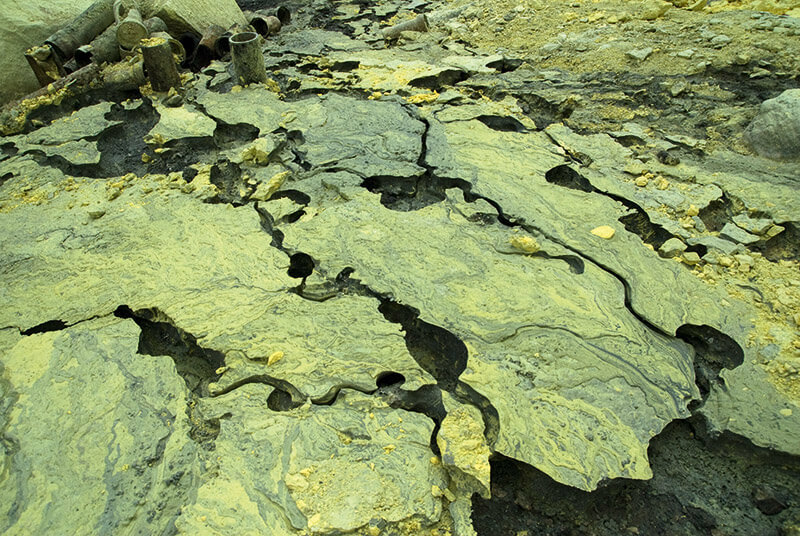 The bizarrely beautiful sulphur rock surface inside the volcanic crater. 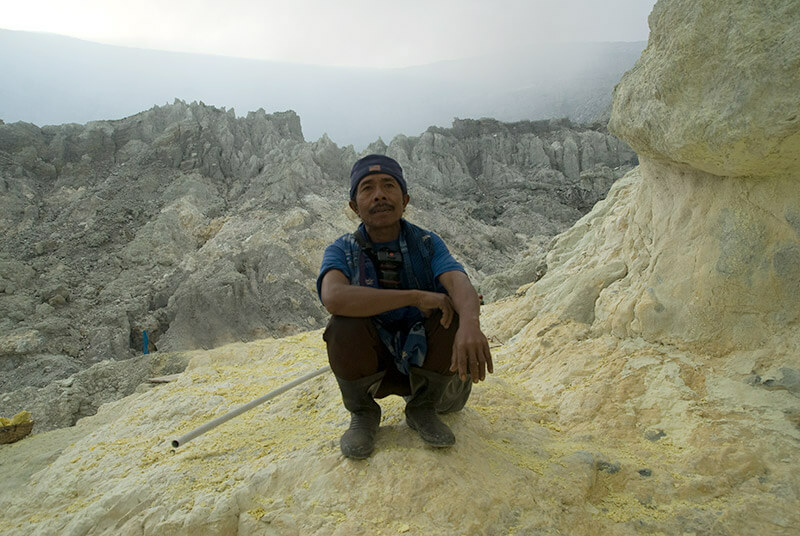 Padi worked as a farmer before becoming a miner in Ijen. 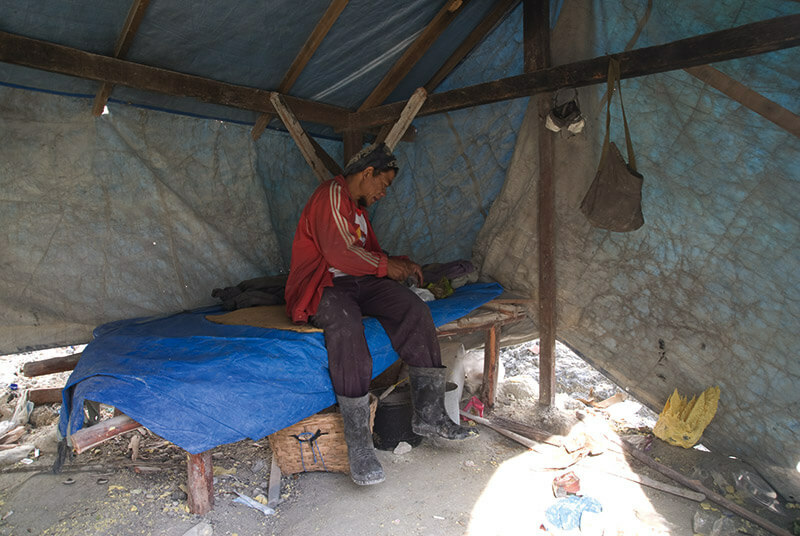 At $10 per day, he earns twice now but he knows that the relative freedom comes at the cost of his shortened life. 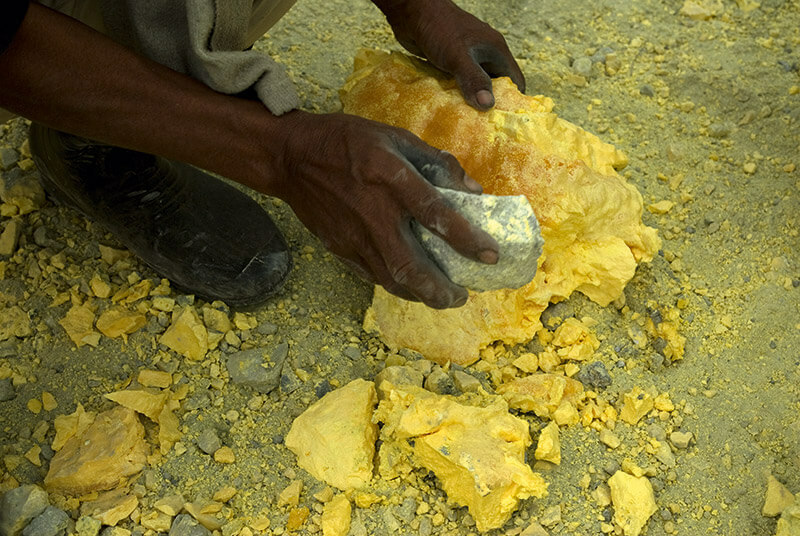 A miner pries sulphur chunks from the solidified rocks of the sulphur bed. 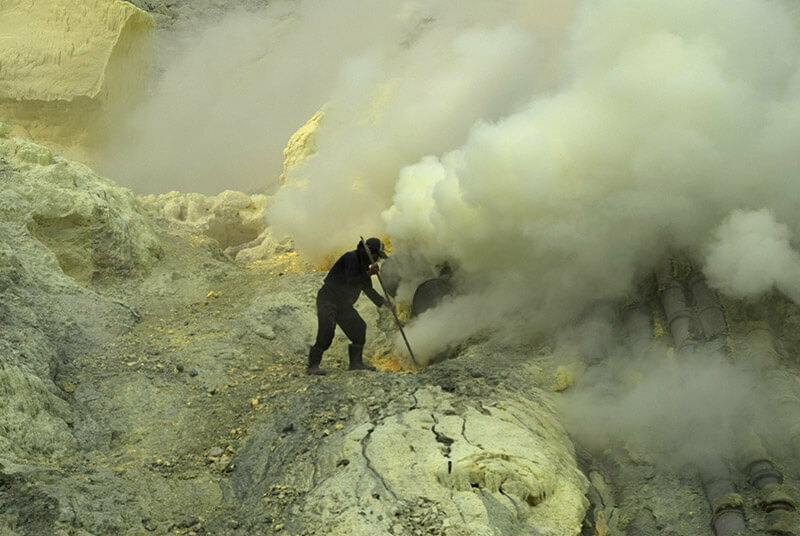 In an age where mechanical extraction process is deployed everywhere, miners use iron rods and stones to harvest the sulphur in Kawah Ijen. The smoky atmosphere that billows around the mine contains highly toxic concentrated hydrogen sulphide and sulphur dioxide gases. 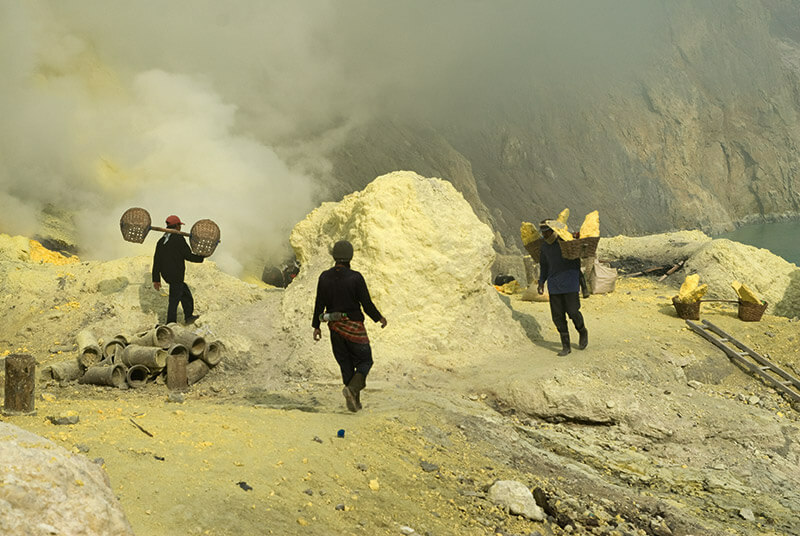 A miner walks away with his sulphur laden baskets while another goes into the toxic fumes to collect his share. Umam is 32 but his deep-lined face looks well over forty. Working in the mine since his teens, he says that he does not care to use protective masks as they slow him down in his work. Sulaiman removes his protective gear and smokes a cigarette. Most workers smoke the local cigarettes with tobacco and cloves to get rid of the foul taste of the toxic gases. 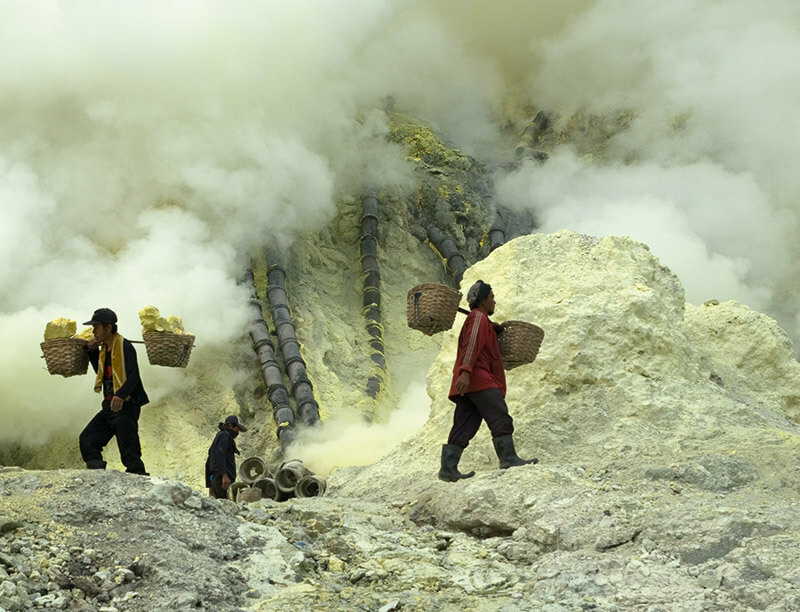 Miners work in thick fumes of noxious chemical smoke. 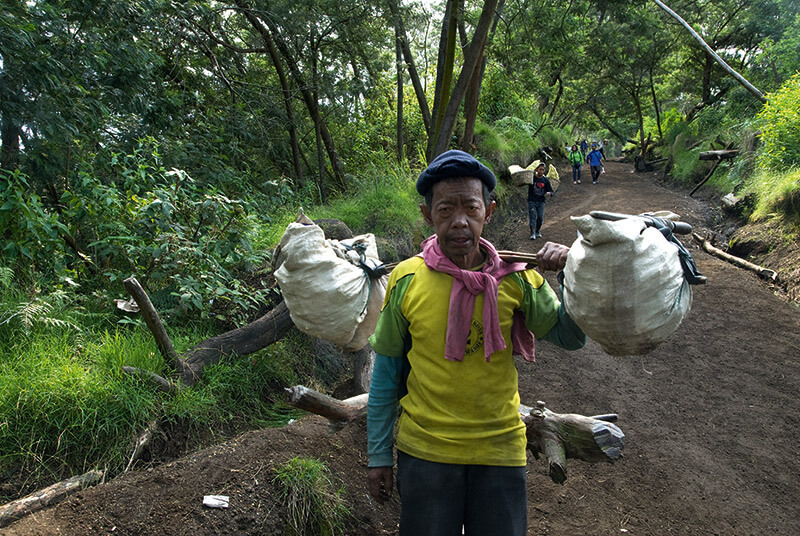 The miners carry 80-90 kg loads up a steep path out of the crater and back down the volcano’s outer slopes to a weighing station. The miners make this journey two or three times a day. 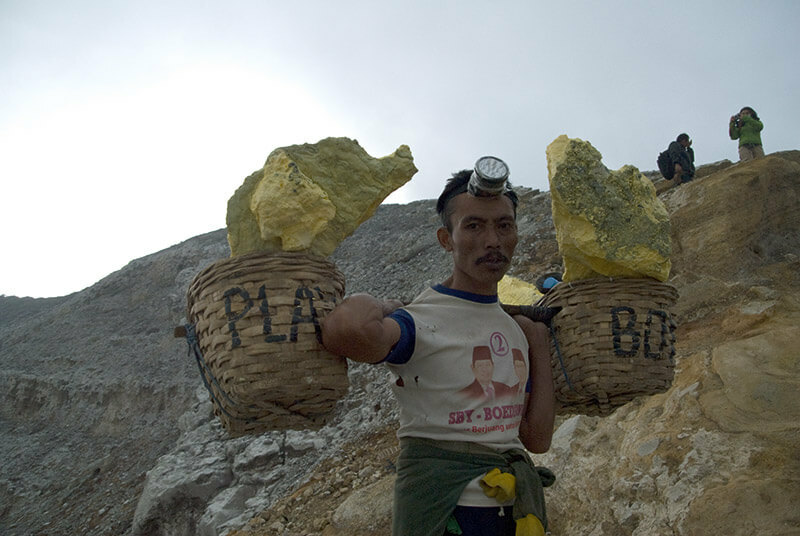 At 44, Tariq is one of the oldest miners of Ijen. Eight of his friends, who had started working with him two decades back, have died in last five years. Addis, 32, now works as a guide for tourists who go down to the crater. He says that his spinal cord is deformed from years of lugging sulphur loads. At the makeshift tent near the crater lake, Suharto recovers from the sudden intake of sulphuric gases. Hundreds of miners have died in the crater due to sudden emission of poisonous gases from the vents. A miner weighs the sulphur taken from the crater at the weighing station that doubles up as a resting place for the miners. 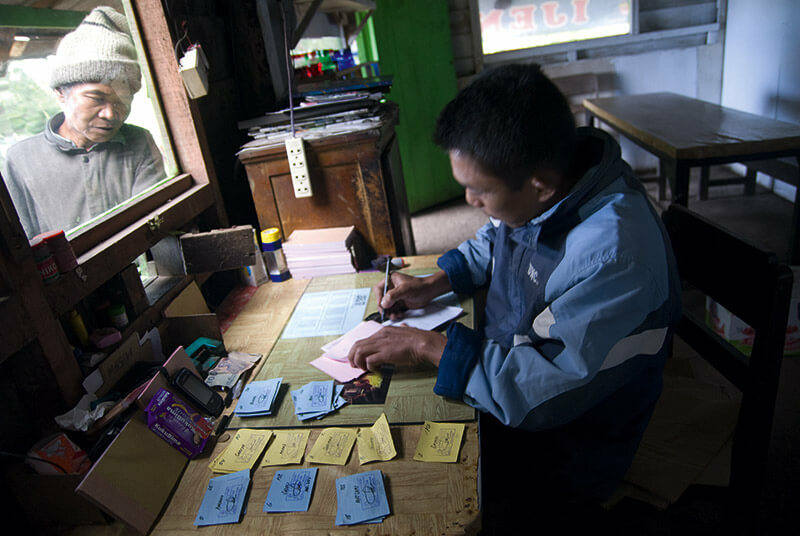 An overseer at the weighing station calculates the earnings for the sulphur collect as a miner looks on. 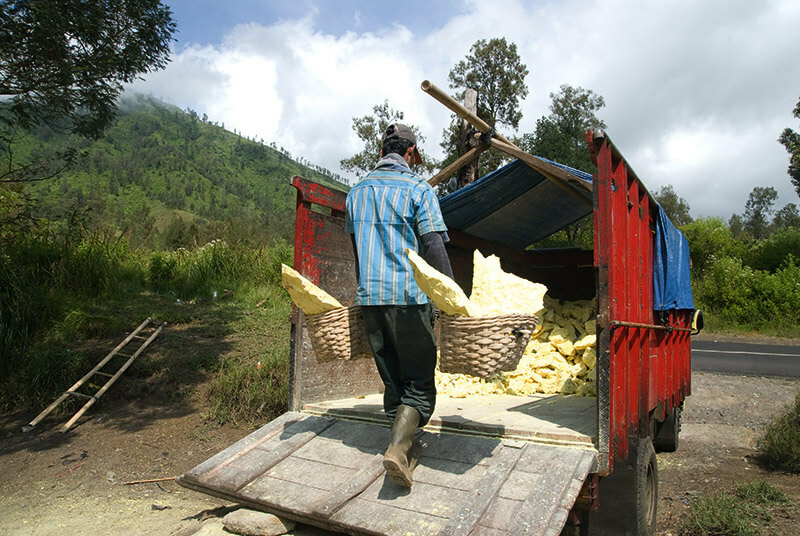 A miner loads his harvest onto the truck to be carried down to a sulphur factory. 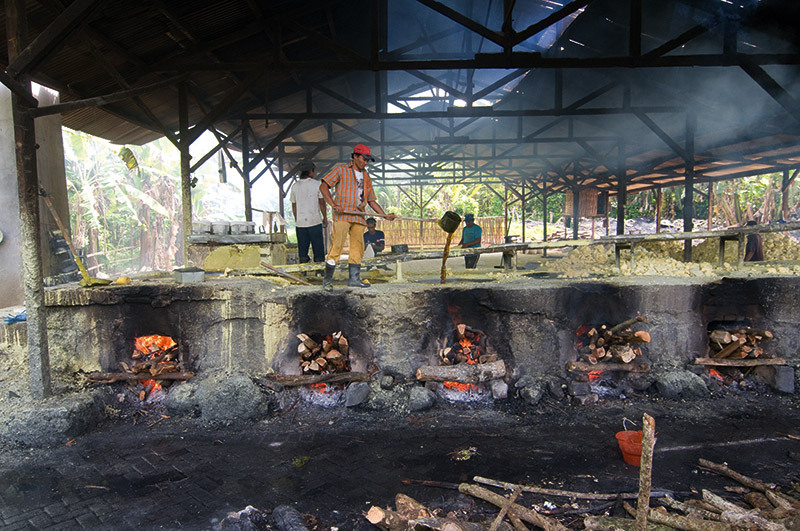 Massive handmade clay ovens are used to melt the sulphur chunks into liquid sulphur. 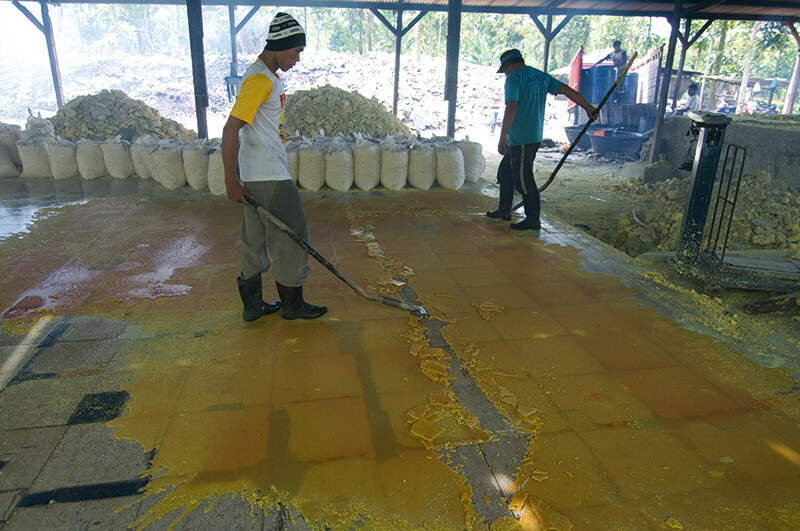 The thin crystals of bright yellow sulphur are broken into pieces before they are transported for commercial use in cosmetics and medicines.